They dreamed new dreams, healed old wounds and tenaciously carried forward the vision, even when it was lonely, so that the Church might be whole, holy and more fully equipped to carry out the work of the Gospel. AnalysisEmerging ModelsIs Amoris Laetitia Good News? Pope Francis issued Amoris Laetitia, translated The Joy of Love, his post-synodal guidance in the form of an apostolic exhortation. The Joy of Love has long been a way of life for many Catholics in many places. 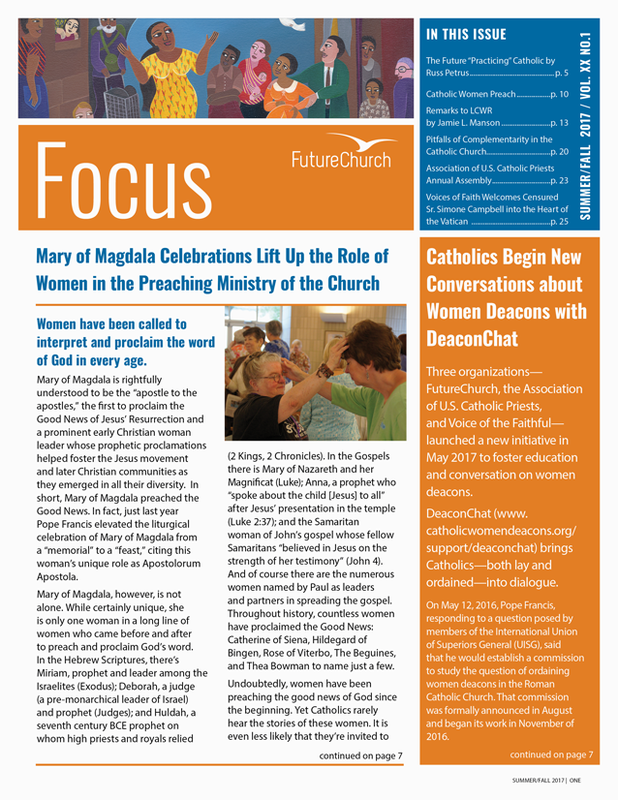 When Pope Francis agreed to “constitute an official commission” to study the question of women deacons, FutureChurch had already laid the groundwork for this unforeseen opportunity. In response to Pope Francis's announcement of a Jubilee Year of Mercy, FutureChurch introduced their Women Witnesses of Mercy series.